In 2006 interior architect Nel Verschuuren has been working on Schiphol Airport for over 40 years from her position at the Kho Liang Ie Associates firm. The decades since 1967, when the first brand-new building was opened, have been marked by expansion, change and adaptation. Working in close co-operation with the architects, she helps ensure that this constantly evolving and expanding building continues to be a place where travellers can find their way and feel comfortable. Back then, in 1963, the commission for designing the Schiphol interior went to Kho Liang Ie (1927-1975). In preparing for this project, Kho visited many different airports all over the world, observing that travellers everywhere were nervous and agitated. Addressing that issue, he made the spaces clear and unambiguous, balancing the busy, fast pace of travel by introducing calm, open spaces, light and long-lasting reliability. His Schiphol did not use much colour; the passengers brought that aspect along with them. That subordinated serviceability was also expressed in the primacy of the signage ˗ designed by Benno Wissing Total Design ˗ and the ban on advertising outside the shopping area. The aim was for everyone to be able to find their way, a task that had previously been left to ground stewardesses. (1)According to Ben Bos, who interviewed Wissing, passengers missed 15% of their flights before that signage was introduced. (reported to the author on 26 April 2006). The yellow signs on the ceiling in particular became the characteristic beacons that guided everyone to their desired destination. Services, facilities and all other (non-flight) information were marked by green signs. Although Kho Liang Ie did most of his work for Schiphol through a separate firm established for that purpose, BISS, which came under the NACO – Netherlands Airport Consultants – in The Hague, his assistants Nel Verschuuren and Tinus van de Kerkhof were naturally involved in this project as well and contributed along the way. The Schiphol interior was not designed by one man or woman, but by a team. Besides the panelling and the layout of the interior, they focused on countless details and many products were designed especially for Schiphol. A small selection from an extensive list: desks and counters, stairwells, bins and coat racks, telephone booths, illuminated signs, ceilings, display cases, bars and sanitary facilities. Product development took place here on an unparalleled scale, in partnership with all sorts of companies. Finishing touches, materials, semi-manufactured modules, components and new products demanded solutions, coordination and implementation. 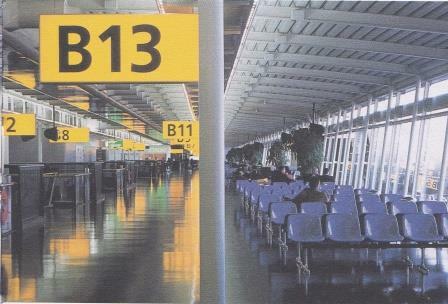 The interior of Schiphol Airport remained largely unchanged until 1975, the year Kho Liang Ie died. After that point, the building entered a second phase, in which increasing flight traffic and architectural expansions led to many changes and innovations. 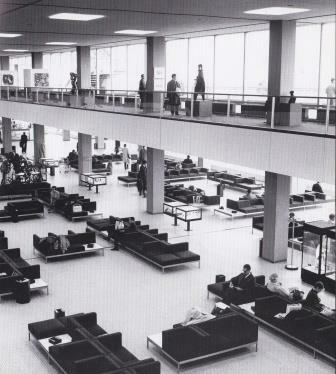 With regard to the furnishings, Verschuuren and Van de Kerkhof followed the scheme that they had developed with Kho: light colours for the lighter rooms (such as the departure hall) and darker colours for rooms that received less light. A grey floor of natural stone was laid in the piers, and each pier had its own colour highlights in the plastic moulded seats, which were placed in groups to punctuate the long hallways. By that point, the first generation of desks and counters were showing signs of wear; they were replaced by an entirely new type. The new counters were made of polyester, with rounded corners on all sides and a rubber bumper on the bottom. Their colour ranged from white (departure hall) to brown (central area) and beige (piers). The ashtrays and bins ˗ made from sewer pipes ˗ and the telephone booths were also round. Shopping units were raised so they could be connected to the air conditioning system. The policy of having artists and artworks help define the space was continued. Artworks, including works by S. Tajiri, G. Rickey, C. Rogge and K. Fransse, served as orientation points and introduced variation in the interior. Some were commissioned by Schiphol itself, while others were donated by affiliated companies. Implementation, coordination and positioning were also arranged by the Kho Liang Ie Associates firm. D.R.A. Stapel, engineer and member of the management board from 1975 to 1987, arrived just after the opening of the North Hall and remembers that everyone endorsed the principles of calm, unity and standing. ‘There was respect for Kho’s conceptual legacy. It was not supposed to become some street fair or carnival. Travel was considered more of an elitist affair anyway. '(3)Stapel in a conversation with the author, 24 April 2006. Decisions were made within a team context, including consultation. There was an architectural department, and the overall image of the airport was monitored. Stapel had great respect for Verschuuren. ‘She was good at defending her proposed solutions and was able to offer us a complete package for those spaces like the VIP room, although I did sometimes play the game by not being satisfied too quickly.’ The ‘beautiful’ aspect of it still had to fit within the schedule of requirements, the logistic parameters and the budget. ‘We had quite a few discussions on that topic, and sometimes I had to defend those higher costs to the board, but we always worked it out.’ Singapore Airport consulted Schiphol and adopted many of its design elements. Lagos had Verschuuren do their terminal. 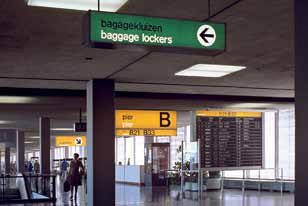 Countless others copied the Schiphol signage or asked for advice from designers like Wissing, and later Paul Mijksenaar. In the late 1980s the architects Jan Benthem and Mels Crouwel were already working on a third transformation of Schiphol, the big Terminal West. With NACO and Nel Verschuuren they worked on this project in a team based in an office at Schiphol. In 1992 they designed the G pier, which was followed a year later by the terminal. This building resulted in an entirely new spatial concept: not an architecture of right-angled boxes but an enormous tent-like hall with as few columns and walls as possible and as much light and view as possible. Everything still took place inside one building, the strong point that made Schiphol so attractive for the many transfer passengers. Clarity, simplicity and calmness remained the guidelines for the interior. Benthem: ‘The biggest problem I faced while designing was that the terminal had to be a well-oiled machine on the one hand and a sort of living room where people felt at ease on the other, (…) creating a quiet, pleasant atmosphere where you don’t see all the technology. '(4)Haarlems Dagblad, 8 May 1993. That peace comes from subdued colours and materials: white, shades of grey, black, natural stone, stainless steel, glass and wood. Only the toilets were given blue tiles so that they could be found more easily. The exclusion of advertisements contributes to the calmness, as does the rule that shops are not allowed to display their own logo. Instead, they are marked with just generic signs: souvenirs, magazines, etc. They are, however, allowed to determine their own interiors, which was not the case in the past. The very characteristic signage system was maintained, although Paul Mijksenaar added pictograms to it and the typeface was changed to Frutiger. Striking artworks (by Carel Visser, Mark Brusse and John Körmerling) and views outside support the traveller’s orientation. The furniture consists of black leather chairs by Tecno. Because of the lack of a suspended ceiling to conceal air ducts and intercom systems, Nel Verschuuren designed vertical black air columns that stand as sculptural objects in space but are still inconspicuous. Some cafes do stand out, among them a gold-coloured sphere (design Benthem and Verschuuren) that conceals a bar, and a tropical beach tent by Nigel Coates. This was done deliberately to avoid monotony. Eight cafe-restaurants were added. In terms of scale, the construction and management processes at Schiphol Airport have grown enormously. In just a few decades, at all levels and in all areas, it’s a matter of more, bigger and more complex. For the designer, personal contact with the client has decreased. While director Stapel or his successor Hans Smits frequently sat down to talk to Verschuuren, they have now been replaced by larger and changing teams of specialists and others involved. And each of those has their own project managers, supervisors and coordinators with their own list of wishes and demands. Engineers and technicians also join in, for example, on the subject of baggage processing or loudspeakers. Although the scale has grown over the years, it is still the architects and interior architect who determine the space. They operate in a symbiotic team in which the problem-solving capacity and the functionality of solutions are the main concerns. As a company, Schiphol is constantly ‘on the move’, working on future plans, and never stationary. Everything is shifting and changing all the time and is subject to great time pressure. Not a day goes by without the airport hitting the headlines: new runways, noise pollution, growth, privatisation, discussion and more discussion. That whole dynamism marks the company and characterises the nature of the assignment facing the designer, which is totally different to other commissions. Schiphol is never finished and Schiphol is never ready. For example, the Schengen Agreement, which signalled the end of passport control within Europe, necessitated the separation of Schengen and non-Schengen passengers. While one pier is being finished, the next is already being demolished. The destruction of one’s own work is an inherent aspect of the never-ending design project for the airport. The paradoxical thing about the interior of Schiphol is that it is not, in fact, an interior at all. It is a series of services, floor and wall finishes, atmospheres and spatial experiences. Passengers are there for a temporary period only and their stay is never an end in itself. It is a decor that people move through, their passing surroundings. How do you shape something like that? For him and for Verschuuren it is a matter of never being present in an inconvenient way with too much design or exuberance. A natural casualness dominates and there is space for the passenger, both literally and figuratively. That means that none of the concepts that have characterised Schiphol as the building from the start have changed or become obsolete. There is a remarkable continuity at the airport, which is also down to the fact that the same people have been working on it for ages and the traditions are passed on. Schiphol is not a building; Schiphol is an endless ‘work in progress’, a capacity to adapt. Although Benthem and Verschuuren have been able to make their authority count, centralised decision-making is not always possible. The building and maintenance services at Schiphol also carry out spatial interventions. 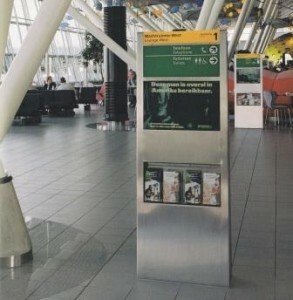 Different information signs sometimes appear suddenly, as do folder displays in places that are not intended for such things, and have a design that was not sanctioned by the designers. Elsewhere too, particularly in the shopping and food areas, commercial and financial interests are gaining influence. The turnover of traders is an important factor for the airport, and that has consequences for the policy and management of the space. Owing to their big financial interests, the managers of the commercial units form a powerful lobby to whom the designers must give due consideration. That is very much in evidence in the big Schiphol-Plaza entrance hall where passengers have to struggle through a cacophony of signs and objects and where orientation is increasingly difficult. The clutter of stalls, advertisements, food outlets and objects like telephone kiosks and machines for train tickets obscure views of access points to the train platforms and block the way to the departure hall. The shops in the retail area try to draw in customers with pretty and not-so-pretty interiors and decorations. Schiphol measures everything — purchasing behaviour, experience value, customer contentment. Those statistics also put pressure on the designers. How, for example, can the merit ratings of the toilets be boosted? Should there be more conviviality? And, a much-voiced complaint: Schiphol is cold and chilly. Why is there no carpet? In that last discussion the designers stuck to their guns. A carpet gets dirty quickly and only really ugly carpet doesn’t show the stains. Moreover, they do not want any labyrinthine detours to guide passengers past even more shops. That said, they have less control than they used to have, and mediocre taste is gaining ground. Recently, for example, Schiphol appointed an ‘experience firm’. But the type of experience that these experts envisage is exactly the opposite of that aspired to by Benthem and Verschuuren. For them, people in space is not just about consuming and amusement. Nel Verschuuren defends quality and functionality. She favours sturdiness and sobriety and delivers tailor-made solutions. To her it is not about having a unique style or making artistic interventions. It is about an approach. This text was published in Dutch in Flow: Het Schiphol van Nel Verschuuren 1968-2005, Schiphol Group, 2006. It is here published again in a slightly abbreviated version because Nel Verschuuren recently passed away. 1. ↑ According to Ben Bos, who interviewed Wissing, passengers missed 15% of their flights before that signage was introduced. (reported to the author on 26 April 2006). 2. ↑ Anonymous, De Telegraaf, 8 April 1967; Jonker, G., ‘Schiphol, respectable achievement’, Het Vrije Volk, 12 September 1967; Vriend, J.J., ‘Schiphol ’67. Transport factory for all-risk nomads’, De Groene Amsterdammer, 29 April 1967; Bavink, ‘Strange folk’, Algemeen Handelsblad, 4 May 1968. (clippings from the archives of Kho Liang Ie Associates). 3. ↑ Stapel in a conversation with the author, 24 April 2006. 4. ↑ Haarlems Dagblad, 8 May 1993.